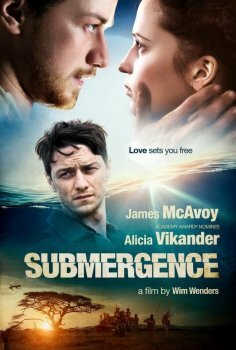 Submergence - Available as a download or stream? James More (James McAvoy) is a hydraulic engineer who has been taken hostage in Somalia by jihadist terrorists, who suspect he is a British spy. Danielle 'Danny' Flinders (Alicia Vikander) is a biomathematic who works on a project of immersion in the deeper waters of the oceans to demonstrate her theory on the origin of life on the planet. A year earlier James and Danny met in an isolated hotel on the French Atlantic coast, where both were preparing their dangerous missions, and there they found, in each other, the love of their lives. Now, separated, Danny begins her dangerous immersion to the bottom of the ocean in Greenland without knowing if James is still alive.